Relentless rain gives much needed boost to UK tulips! 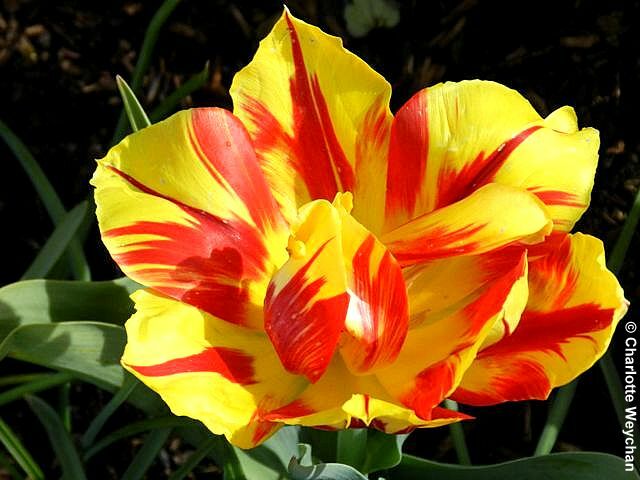 It's peak tulip season and although gardeners around the country have been complaining that theirs are stunted due to the hot spell in March, and the lack of rain earlier in the year, there's a lot to be said for these joyous flowers that hold their heads high at this time of year. Choose your venue and you see them standing like soldiers in lines, or interspersed with other plants and with all the rain we've had in the last few weeks, you may want to get out and see them this weekend, because there are some spectacular tulip displays on the menu. Dunsborough Park in Surrey (above) is open on both Saturday and Sunday (28th/29th April) and offers a rare chance to see around this garden, which opens for just seven days each year - you can see thousands of tulips standing in line like soldiers in the walled garden (above) or take a stroll in the meadow (top) where you will see the deserters! 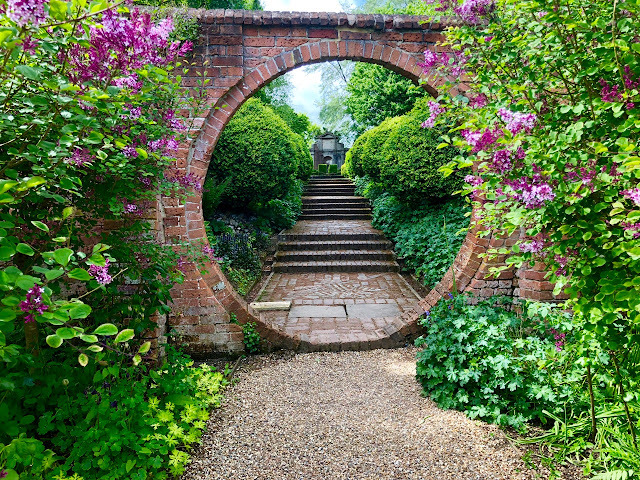 But this is also an opportunity to see the rest of this garden, which has been restored by the current owners. Open both days from 14.00 - 17.00, entrance fee £5. Also open later in the year for the NGS (see website for details). 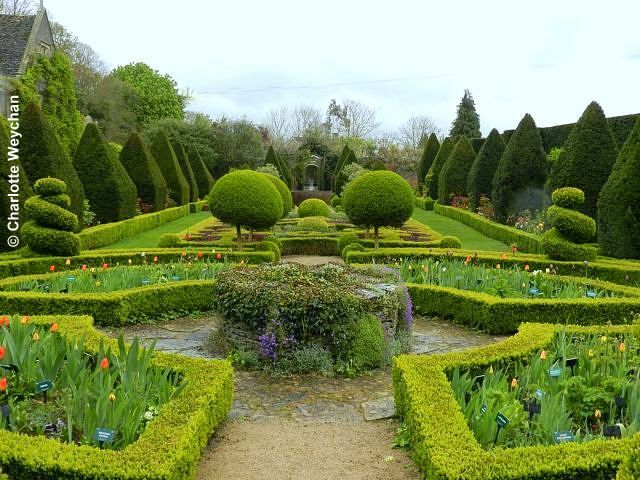 It's unusual to find a garden as large as Abbey House Gardens at the heart of a bucolic country town, but head to Malmesbury in Wiltshire and you'll find really excellent tulip displays at this time of year. What impressed me most about the tulips here is the fantastic labelling, which gives you a chance to see what you'd like to grow at home. 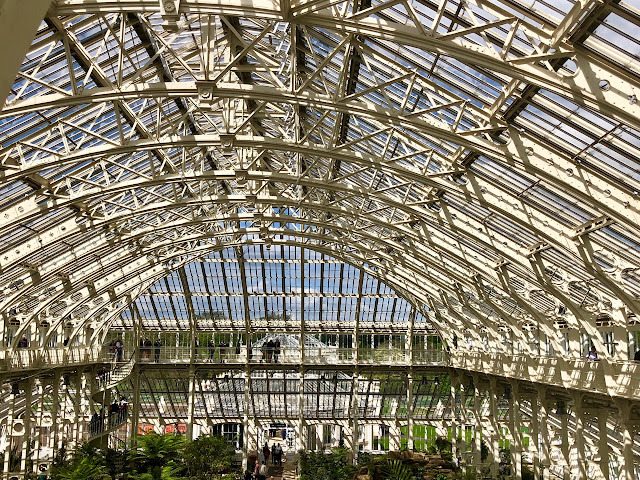 And you won't find them standing in straight lines either - they're mixed in with other plants. 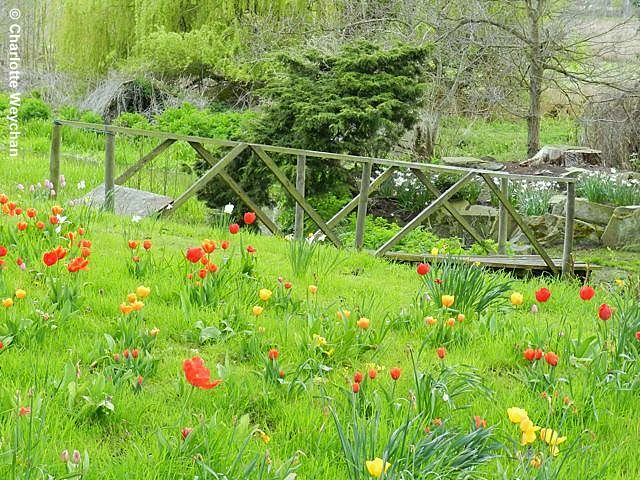 Abbey House is located next to the abbey ruins that it takes its name from and is open throughout the year, so if you miss the tulips, you can visit this five-acre garden at any time. Open daily 11.00-17.30. 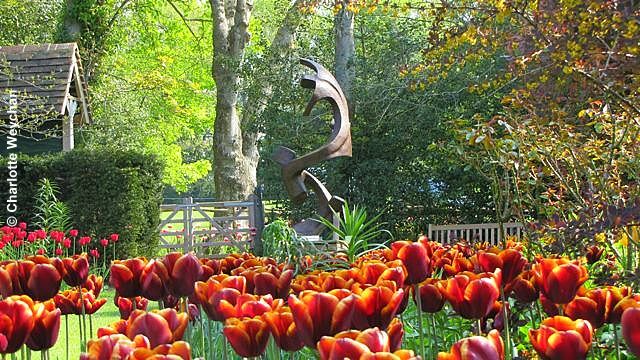 Pashley Manor in East Sussex has long been a leader in terms of its tulip planting and you'll be amazed by the variety on offer at its annual Tulip Festival, which runs until 7th May, although you can expect to see some stragglers after this because of all the recent rain. There really is only one way to describe the tulips here - spectacular! 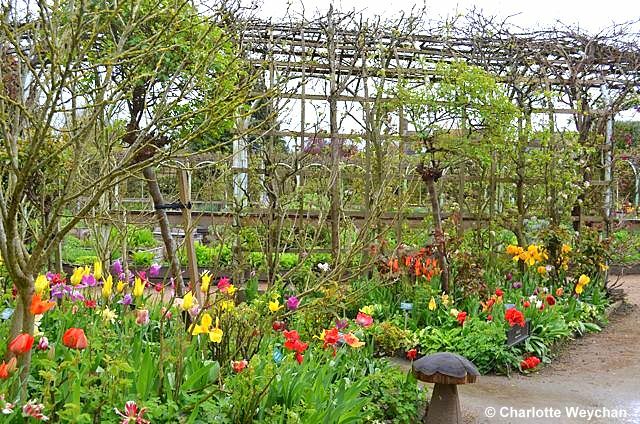 And with more than 20,000 bulbs planted each year, you're guaranteed to find something here that you haven't seen before. The sheer volume of bulbs at Pashley means you will wander into each section of the garden and be amazed. Well worth making a special effort to get there! Open every day from 11.00-17.00 (click on this link for more pictures from last year's festival). 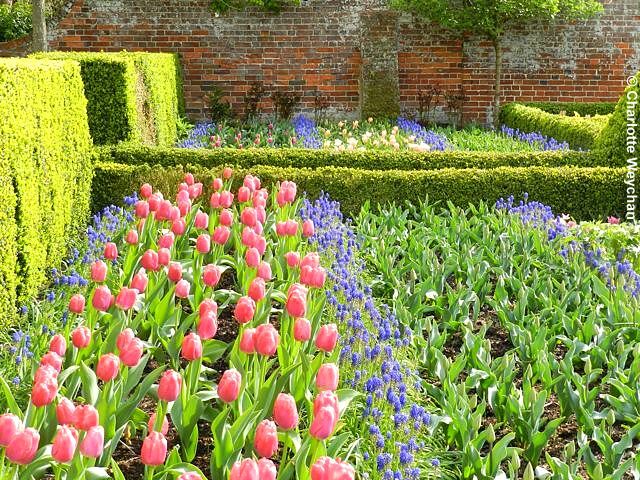 Several National Trust properties are running Tulip Festivals this year, including Dyhram Park, Polesden Lacey and Waddesdon Manor, although I haven't managed to see them. 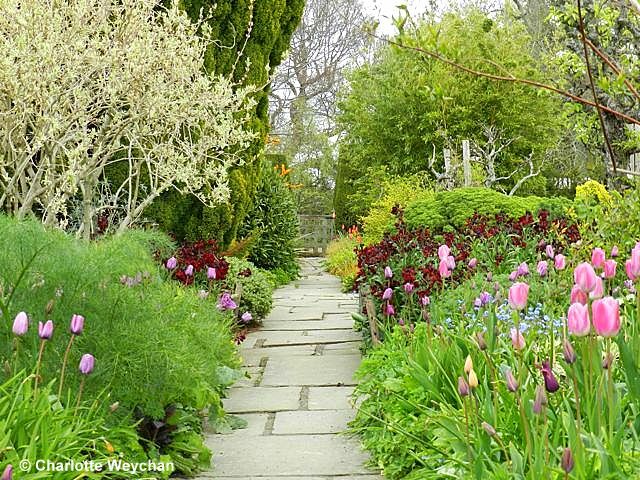 Elsewhere, gardens worth travelling to for the tulips include Great Dixter, which is already well into bloom. What amazes me about all these venues is the effort that goes into planting all these tulips every year. I cannot imagine how back breaking it must be to plant 15,000 bulbs for a display that lasts little more than a month. But when you see the results as a spectator, you can understand why they do it - a memory to savour on rainy days ... and we've had enough of those here recently! I love the Abbey House display, but they're all incredible! I love Tulips, but I don't grow them anymore because the rabbits eat them. I might try a grouping surrounded by Daffodils--we'll see. But they sure are beauties! Certainly worth all that effort for such spectacular display! A delight to the eyes!